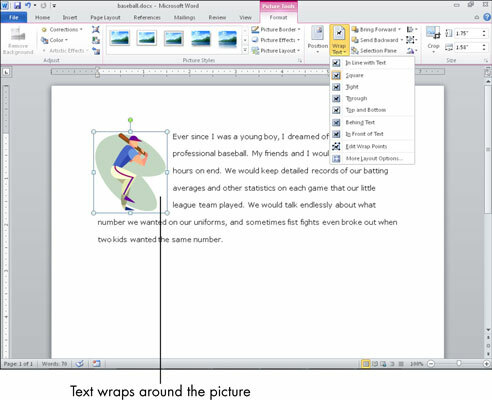 In Microsoft Word, you can wrap text around a picture. The default text wrapping for a picture is In Line with Text. This type of alignment makes Word treat the picture like an individual character of text, wherever you put it. As the text floats, the picture floats, too. In this mode, the options are limited as to where you can place the picture because it has to remain associated with a paragraph. In Line with Text: The picture is a part of the paragraph; the text doesn’t wrap around it. Square: Text wraps around the picture’s rectangular outer frame. Tight: If the picture is clip art that doesn’t have a colored background, the text wraps around the edges of the image itself, not of its rectangular frame. Otherwise, it’s the same as Square. Behind Text: The text appears as an overlay on top of the picture. In Front of Text: The image appears over the top of the text, partially obscuring it. Top and Bottom: The picture interrupts the text, which flows above or below it. The picture is on a line all by itself. Through: Mostly the same as Tight.